Mercedes-Benz presents the new C 63 AMG Coup?©, a stand-alone, high-performance car that appeals to all the senses: unmistakable design is teamed up with a high-performance drive system and dynamic handling. The new Coup?© rounds off the successful C-Class AMG model range, which includes the classic Saloon as well as the practical Estate models. The C 63 AMG Coup?© also enhances the AMG family of Coup?©s: in addition to the CLS 63 AMG and the CL 63 AMG, Mercedes-AMG GmbH is now able to offer another dream car featuring a high-performance eight-cylinder engine. The market launch commences in July 2011. Looking particularly attractive is the "Edition 1" of the C 63 AMG Coup?©, available from launch and featuring exclusive equipment. The AMG 6.3-litre V8 engine in the C 63 AMG Coup?© has a maximum output of 336 kW (457 hp) and peak torque of 600 Nm, delivering powerful traction and first-class performance figures: the Coup?© accelerates from 0 to 100 km/h in 4.4 seconds and the top speed is 250 km/h (electronically limited). With this kind of specification, the new two-door vehicle is set to take the lead in its segment. r the C 63 AMG Coup?© are 12.0 l/100 km. This fuel consumption figure also applies to the performance version generating 358 kW (487 hp), courtesy of the AMG Performance package. Available as an option, this package improves acceleration from 0 to 100 km/h to 4.3 seconds, with technology transferred from the SLS AMG responsible for the 22 kW (30 hp) increase in output. The forged pistons, connecting rods and lightweight crankshaft adopted from the gull-wing model's high-tech drive system save three kilograms in weight. This reduces inertia and enhances the agility and responsiveness of the high-revving, eight-cylinder naturally-aspirated engine. Visually, the AMG Performance package can be identified by the variable intake manifold in titanium grey under the bonnet, the AMG high-performance braking system with composite front discs and red painted brake callipers all round, the carbon-fibre spoiler lip on the boot lid and the AMG Performance steering wheel in nappa leather with an Alcantara?® grip area. 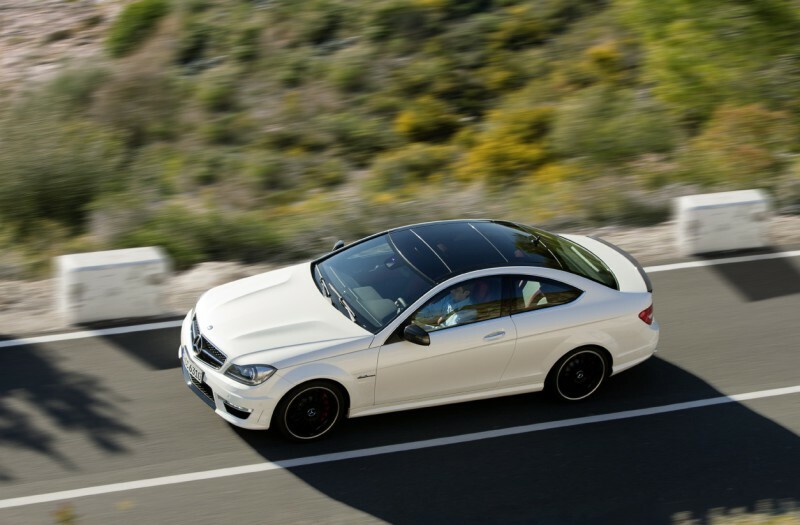 The AMG SPEEDSHIFT MCT 7-speed sports transmission provides direct and dynamic power delivery. Rather than using a torque converter, it has a compact, wet start-off clutch which reduces the losses associated with conventional automatic transmission and thereby significantly lowers fuel consumption. The Controlled Efficiency "C" mode also plays a significant part in this. By providing earlier and more comfortable upshifts while maintaining the lowest possible engine speed and "soft" accelerator characteristics, the AMG SPEEDSHIFT MCT 7-speed sports transmission helps the driver achieve better fuel economy figures. the RACE START function the driver can explore the vehicle's full acceleration capability. It is not just the engine and power transmission which characterise the C 63 AMG Coup?©'s dynamic quality â€“ the AMG sports suspension and AMG high-performance braking system are also key here. In contrast to the series production suspension system, the top-of-the-range AMG model has a specially designed three-link front suspension, reinforced multi-link independent rear suspension and a wider track all round. The stiffer elastokinematics, the autonomous axle kinematics with more negative all-round camber and stabilisers with a larger cross-section all give greater responsiveness and greater lateral acceleration. Selective damping with specially modified spring and damper rates optimises both the response characteristics of the springs as well as the ride comfort. The AMG sports speed-sensitive power steering with direct steering ratio (13.5 : 1) gives excellent road surface contact and makes a significant contribution to the vehicleâ€™s direct, responsive handling. This is complemented perfectly by 3-stage ESPïƒ’: the Electronic Stability Program gives three individual control strategies at the touch of a button: the ESPïƒ’ button in the centre console allows the driver to choose between â€œESP ONâ€?, â€œESP SPORT HANDLING MODEâ€? and â€œESP OFFâ€?. The AMG high-performance brake system has internally ventilated and perforated brake discs on all wheels: it is characterised by outstanding responsiveness, short stopping distances and excellent fatigue strength. The Coup?© version of the C 63 AMG is compelling in visual terms as well, with an assured, athletic presence that is reminiscent of the high-performance SL 63 AMG Roadster. 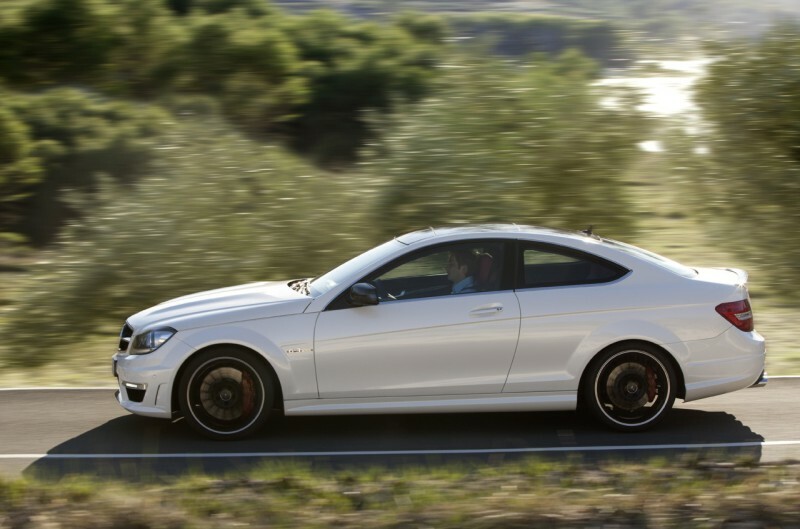 All AMG-specific design features have been skilfully combined with classic coup?© proportions. This compact two-door Coup?© excites with its low profile, powerful-looking shoulder line and slimline C-pillar. The short overhang, long engine cover, steeply sloping windscreen and long, stretched-out roof are also striking elements of its overall style. The distinctive, strikingly arrow-shaped front section is characterised by features typical of AMG: a new AMG front apron including lower cross-struts finished in high-gloss black, LED daytime driving lamps specifically created for AMG and side air outlets. The large Mercedes star is positioned on a wing-shaped horizontal grille slat in the new radiator grille and, together with the newly-designed aluminium engine cover which has powerdomes, underlines the masculine feel of the vehicle. The new clear glass headlamps, in particular in combination with the Intelligent Light System (ILS) as an optional extra, are further eye-catching features. When viewed from the side, the wide front wing bearing the "6.3 AMG" legend, the AMG side sill panels and the new, high-sheen AMG 5-twin-spoke light alloy wheels in titanium grey finish all stand out. Good contact with the road is provided by the wide 235/40 R 18 (front) and 255/35 R 18 (rear) tyres. Attention is drawn at the rear to the distinctive AMG rear apron with a striking black diffuser and three diffuser fins as well as the two chrome twin tailpipes of the AMG sports exhaust system. On opening the door of the C 63 AMG Coup?© passengers enter a specially designed, dynamic interior of quality. 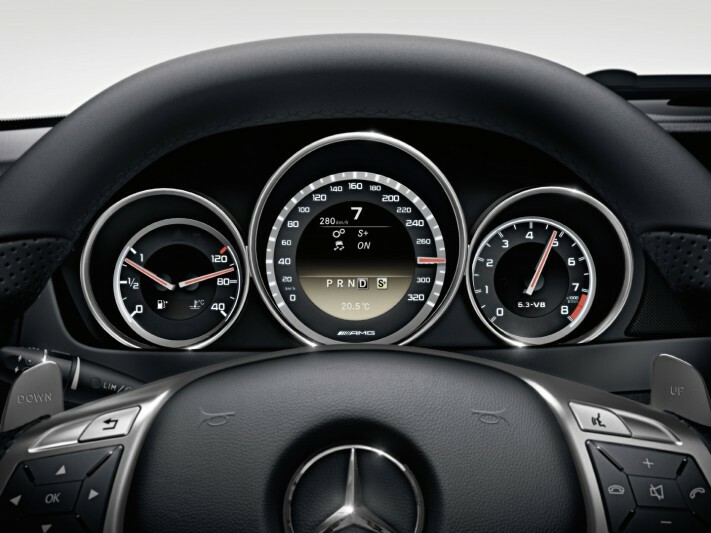 The instrument panel with integrated screen immediately recalls the new CLS 63 AMG. Three sporty, separate round instruments provide information on speed, engine rpm, fuel level and coolant temperature. Other display options are incorporated into the AMG main menu. This can be accessed via the multifunctional buttons on the steering wheel. Located in the middle of the speedometer, the three-dimensional, colour TFT display welcomes the driver by showing an AMG logo when the vehicle is unlocked. The specially shaped AMG Performance steering wheel is familiar from the CLS 63 AMG: amongst its special features are the steering wheel rim, flattened at both the top and bottom; the metallic trim, the grip areas which are covered in perforated leather; and the aluminium shift paddles. Trim elements in high-gloss, black piano lacquer look on the instrument panel and doors emphasise the high quality of the interior. Situated on the centre console is the rotary control for selecting the C, S, S+, M and RACE START drive programs. The new AMG sports seats with integral head restraints, EASY ENTRY system and high-quality AMG badges have sporty, horizontal seamlines. The ARTICO/ DINAMICA black upholstery combination comes as standard. DINAMICA is an innovative, breathable man-made fibre which is easy to grip and skin-friendly and distinguishes itself through its low emissions and high degree of light-fastness. While the side seat bolsters of the AMG sports seats are upholstered in ARTICO, the DINAMICA can be seen in the centre panels. The C 63 AMG Coup?© is a fully fledged four-seater with the rear seats featuring the same style of horizontal seamlines as the AMG sports seats. To enlarge the luggage compartment, the backrests in the rear can each be folded down as standard. Available as an option, designo leather appointments give the interior an even more exclusive character: four single-tone colours and three two-tone combinations are available. These can also be complemented with "extended black designo leather appointments" for the top section of the instrument panel. With seven airbags as standard, belt tensioners and belt-force limiters for all seats, the C 63 AMG Coup?© has extensive safety features. The airbags, which can deploy in milliseconds in the event of an accident, include front airbags for the driver and front passenger, a kneebag on the driver's side, sidebags, pelvisbags and windowbags for the driver, front passenger and rear passengers. The side protection system â€“ comprising headbag and sidebag â€“ optimises the level of protection afforded to individual parts of the body. 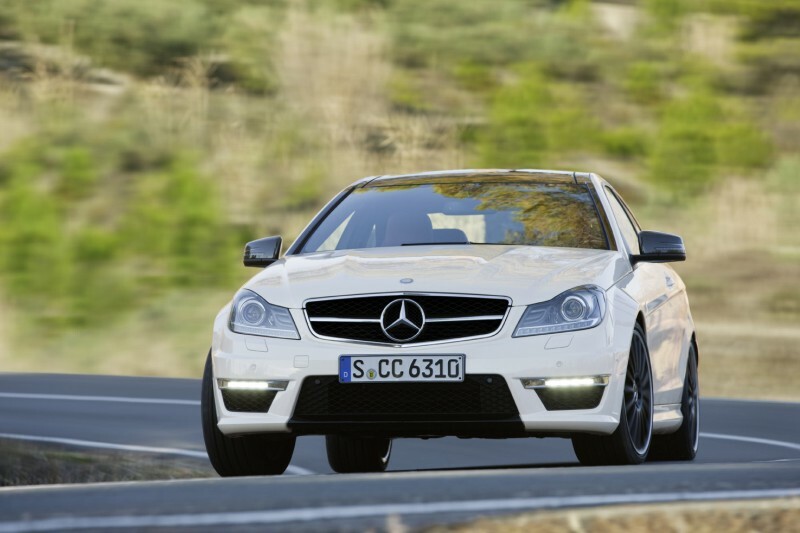 With numerous driving assistance systems ranging from ATTENTION ASSIST drowsiness detection to DISTRONIC PLUS proximity control, the C 63 AMG Coup?© provides a comprehensive level of driver support and protection. The assistance systems are familiar from the flagship S-Class and the trendsetting CLS, and are based on the latest radar, camera and sensor technology. They cover frequent accident causes such as driving too closely, fatigue and darkness. The C 63 AMG coup?© also features a new telematics generation which received its global premiere on the Saloon and Estate models. Major new features include greater operating convenience, larger displays, phone book transfer, display of SMS messages, wireless music reproduction via Bluetooth and a USB interface now accommodated in the centre armrest. The multimedia system COMAND Online now provides internet access for the first time. When the car is stationary, customers are able to browse freely or surf to a Mercedes-Benz Online service whose pages load particularly rapidly and are also easy to use while on the move. The integral services include weather information and a special destination search via Google, as well as the option of downloading a route that has been previously configured on a PC using Google Maps and sent to the car. The navigation system of COMAND Online also has added functions. New features include a 3D display with plastic city views. Also new: routes covered can be recorded and repeated later, specific personal destinations can be imported via an SD card and four alternative routes can be displayed on the navigation map, one of them a particularly economical variation. The Becker?® MAP PILOT makes a low-cost navigation function, which can also be retrofitted, available for the entry-level Audio 20 CD radio. Its advantages over aftermarket solutions include integrated operation via the central controls and the Audio 20 display, a concealed location in the glove compartment and updating via an internet portal. Specially designed, premium quality "Edition 1"
As for the CLS 63 AMG, an "Edition 1" of the new C 63 AMG Coup?© is also available. The Edition 1 features exciting, premium quality interior and exterior details that have been specially designed: the AMG sports seats, door centre panels and armrests come in high-quality black designo leather with contrasting porcelain seams on the sports seats. To match this, the trim parts have a porcelain piano-lacquer look and the two-tone AMG Performance steering wheel sets black nappa leather off with a lower section in porcelain designo leather. An "Edition 1" badge on the trim indicates this version's singularity. AMG multi-spoke light-alloy wheels, supplied as standard in designo magno night black matt finish make the C 63 AMG Coup?© Edition 1 look equally special on the outside. 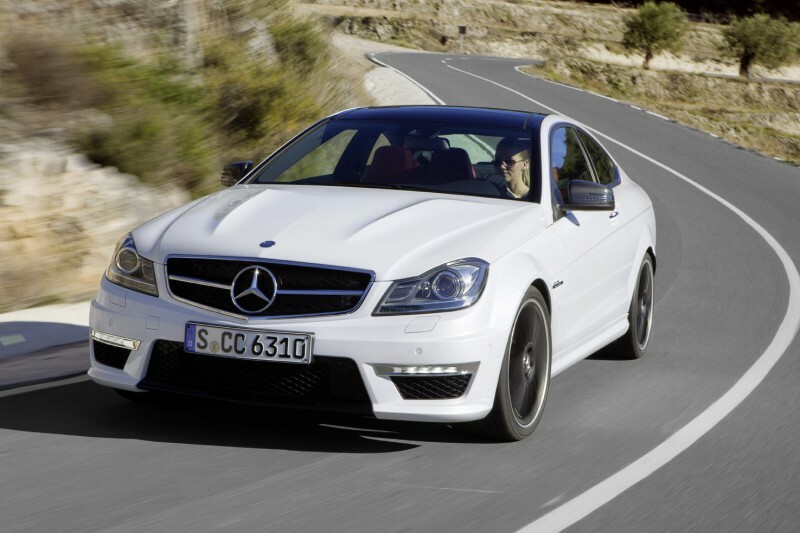 The market launch of the new C 63 AMG coup?© starts in July 2011.